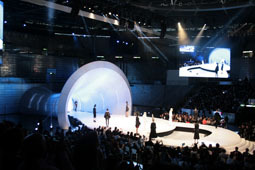 Wella, the haircare company, invited top colorists and stylists from all over the world to show their best at Wella Trendvision 2012 in Madrid. The event was produced by Jack Morton Worldwide's London office. 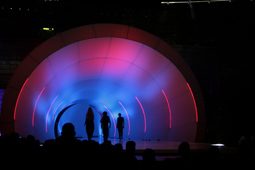 Thanks to the efforts of Matias Gravenhorst of Magrada Proyectos (our agent in Spain, Italy and Portugal), Transformit was invited to realize designer Lisa Vandy's vision of a grand stage entrance. 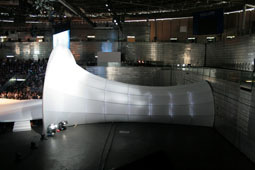 Her idea for the Wella "trumpet" (16m x 12m x 8m) was to draw the audience's attention completely to the models entering the stage. 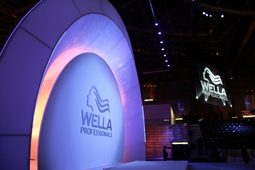 Madrid is home to many fashion shows, but this hair show put on by Wella is extraordinary. Check out this video of unbelieveable hairstyles here. 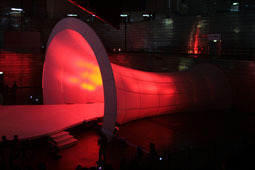 Transformit created the fabric entrance tunnel that culminates in a grand proscenium, and shipped it over to Europe for the show. NOTE: By special arrangement with Jack Morton Worldwide, this one-of-a-kind structure may be rented from us for corporate or private events. Contact us for details. Check out the time-lapse video of the structure being dismantled below. Double click for full-screen.